“The secret message of the falling stars” is a transmedia storytelling experience created and produced by Max Giovagnoli. The rabbit hole of the project was the shortmovie “The sea in my veins” (Il mare in vena, 2011), released in march 2011 and awarded by “Cairo Mediterranean Literary Festival” after the “arab spring”. The story started in Rome, where Giuspe, a 16 years ADHD student, forces his teacher April to go with him in Ireland to find his parents. The plot of the movie covered the first 50 pages of the novel “The secret message of the falling stars”, published nine months later in Italy, where the story of Giuspe and April becomes a thrilling “on the road” through Ireland, from Dublin to the wildlife of a little village in the northern part of the island. A clandestine drug trafficking, a violent chase and the magic presence of an old woman, Erin, who works as a lighthouse keeper after hers husband’s death, complete the story. One months after the publishing of the novel, the author has released the webcomic “The real history of Erin”, telling the backstory of Giuspe’s mother 20 years before, during the “troubles” in northern Ireland. One month after the publishing of the book, was the time of the iPad edition of the work. The launch of the project was empowered by: the online press campaign of the shortmovie; a teaser trailer published on Youtube and facebook one month before the publishing of the novel; a booktrailer made and viralized online on msn by 50 italian students of the school where the author really teaches (two weeks before the novel arrived in the bookshops, actually); a reading-tour with the irish singer Kay McCarthy, performing the soundtrack of the novel (two weeks after). An apple blogging campaign made by the italia agency Enhanced press for the launch of the iPad version. 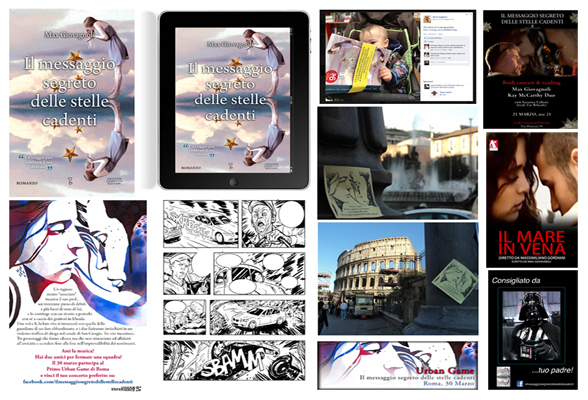 One month after the release of the novel, a post-it campaign in the centre of Rome accounced the first italian “Urban book game”. Young students and teachers, in team of two or three, played the italian location of the novel in a quest organized by Urban Experience Agency using qr-code, gps and human statues. Prize: tickets for a REM cover’s band concert (since REM was Giuspe’s favourite band, the music that he often hears playing in his mental “shell”). In the same days, a facebook contest awarded the best “meme” and the best “demotivational” created by fans of the novel. Then, a huge google-lit trip was realized by 10 students of Roberto Rossellini’s Film Institute of Rome in the days immediately after the game. Il progetto transmediale di “Il mare in vena” è partito con un cortometraggio (Il mare in vena, produzione Romanimata) che un anno prima dell’uscita del romanzo ha raccontato sua la prima parte ed è stato presentato al Cairo Mediterranean Literary Festival durante la “primavera araba” nel 2011. Poi è venuta l’uscita del romanzo (edito in Italia con il titolo “Il messaggio segreto delle stelle cadenti”, da Newton Compton Editori). Quindi, una serie di trailer virali dedicati alle back-stories dei protagonisti (realizzati dalla factory Inventori di Mondi), e due campagne ghost su social network più una post-it campaign e un minitour musicale con la cantante irlandese Kay McCarthy (in due tappe, organizzato dall’etichetta discografica Elikonia). Infine, un urban book game interattivo, ovvero una caccia al tesoro urbana a squadre nelle 6 location romane del romanzo organizzata con Urban Experience, rivissute dai lettori interpretando contenuti reali e digitali (video e testuali, scaricabili attraverso qr-code) della storia. Punto di arrivo finale del progetto, una applicazione per iPad e il webcomics dedicato a una parte della storia non raccontata nel libro. Giuspe ha sedici anni e un passato difficile, trascorso tra orfanotrofi, case famiglia e la vita violenta di certi quartieri di periferia. Soffre di un disturbo poco conosciuto, l’ADHD, che lo rende impenetrabile e incapace di controllare i propri impulsi. Aprile è il suo professore, un trentenne pieno di debiti che colleziona amori sbagliati o impossibili, e ha un’esistenza tutta da ricostruire. Le vite dei due si intrecciano ben oltre i banchi di scuola quando, un giorno, sono costretti a fuggire insieme in Irlanda. Ne nasce un viaggio indimenticabile, fatto di incontri inattesi, situazioni tragicomiche e di un universo palpitante di avventure che culminano in un violento faccia a faccia nel Nord selvaggio e inospitale dell’isola. Ma sarà Érin, la guardiana di un vecchio faro che vive congelata dalla nostalgia e dal ricordo di chi ha perso da tanto tempo, a sparigliare le loro vite e a cambiarle per sempre.